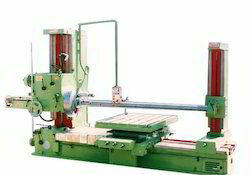 OM International Machine Tools is manufacturer & exporter of Horizontal Boring Machine which used for roughing out large components but there are high precision models tool. We brings the chance for every enterprise to buy Horizontal Boring Machine in India at budgeted prices which suits their pocket. To cater to the demands of our customers’ requirements, we are highly engrossed in providing the finest quality Horizontal Boring Machine. This boring machine is extensively used at construction sites for boring purposes. Boring machine provided by us is manufactured from the well-tested components and sophisticated technology. In order to meet the particular needs of the clients, we provide this boring machine in numerous models at nominal rates.